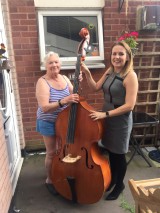 We have kindly been bequeathed a Double Bass by a long-term member of The Stafford Orchestra, Rusti. She handed over her Bass in summer 2016 and we are looking forward to offering a sponsorship opportunity soon! For more information - please 'Contact Us'.